The National Automobile Dealers Association (NADA) recently published a report entitled, "The Impact of Federal Regulations on Franchised Automobile Dealerships." According to the findings, dealerships across the nation spent a total of 3.2 billion to comply with government regulations. Some dealerships claim that these numerous regulations are a burden on their ability to conduct business, "We are basically being regulated to death," said Geoffrey Pohanka, chairman of the Pohanka Auto Group. 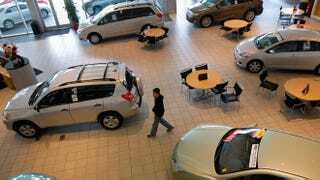 "In 2012, the average dealership spent $182,754 to comply with federal mandates governing employment, business operations, vehicle financing, sales, marketing, vehicle repair and maintenance, the study said. The regulatory costs equaled about 22 percent of the average dealership's pretax profits, or about $2,400 per dealership employee. The average dealership needed to sell 106 vehicles in 2012 to recoup its regulatory compliance costs, the report concluded." So what are all these regulations that dealerships have to comply with? You can read the full report here. In summary, they run the gamut from the Americans with Disabilities Act, Clean Air and Water Acts, Fair Credit Reporting Act, and several others. "While an applicant with a sketchy credit history can get a car loan, Department of Homeland Security regulations stipulate a car-buying terrorist must not get one. The dealership must report to DHS any potential car buyer who might fit a terrorist profile. But the regulations are not easy to interpret, a dilemma exacerbated by the fact that terrorists tend not to announce their occupation when filling out lending applications." Whether or not these government regulations are necessary or effective is another conversation. However, practically every industry has to contend with numerous regulations and thus have increased costs associated with them. Sometimes these extra costs have to be passed on to the consumer. So how much do these regulations add to the price of your car? "When considering both new and used vehicle sales, the mean cost per vehicle is $100." One hundred dollars…. or roughly .32% of the average new car transaction price of $31,252. I would be curious to see how the cost of government regulations on the dealerships compares to the consumer impact in other industries. Are these regulations really a massive burden on car dealers or are the numbers less scary than they seem? I expect a fairly contentious political debate in the comments.